− one = four Required Please enter the correct value. We stand at the forefront of an unstoppable economic revolution. 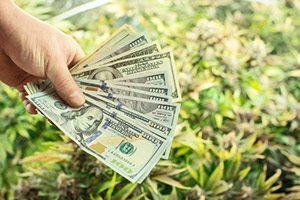 With each day that passes, more farmers are becoming millionaires from growing cannabis. Bold entrepreneurs are opening dispensaries from coast to coast. The lines to get in are stretched around the corner. And most of their new customers are senior citizens. Cannabis tourism has become the latest craze in travel. People are now skipping Napa Valley wine tours, choosing instead to embark on weed tours in Colorado and Oregon. Then pay very close attention to everything you're about to hear. Because America's green gold rush is just getting started. They're all preparing to push billions upon billions of dollars into this market. Your reward could be the kind of wealth that lasts for generations.